If you are longing for the fast pace of life to slow down, you’ll find the charming world of Rabbit Hill Cottage the perfect solution. From the moment you walk in the door the warmth of the house will envelop you. From the living room with lots of seating and a wood burning fireplace to the family/reading room next to it or the den with the flat screen TV there are so many places to gather everyone together or to find a quiet little spot and catch up on that book you’ve been trying to finish. The main level of the house has the living room, reading/family room, dining room, kitchen, and breakfast nook. Also on this level is the master bedroom with an attached bath. The light and airy feeling of the room is especially appealing. The main bath is located in the hall just off the breakfast nook. Heading up the stairs leads you to the second bedroom which has a queen bed and in the opposite corner of the room is a small bed next to some shelves with dolls and toys, the perfect spot to set a little one down for a nap. Going downstairs from the hall sends you to the den with comfy seating and a flat screen TV for movie nights. Just to west of the den is the third bedroom with a queen bed and bunk beds. When it comes to the back yard Rabbit Hill Cottage is special. Besides the large deck, wood shed for the living room fireplace, fire pit for making s’mores, and BBQ grill there is one more amenity sure to please the youngest members of your group. Take a look at the Kid’s Kottage. This is a sweet spot that all kids ( big and little! ) will enjoy. From working and displaying artwork to playing store there's something for all your kids to enjoy. There's also a large side and back yard to play games in or just sunbathe and relax. The home is on the north side of Cannon Beach near the first exit into Cannon Beach. 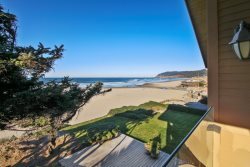 The beach is short stroll away,close by through Les Shirley Park, and downtown Cannon Beach with it's shops, galleries and restaurants is only a few blocks away. If you need a moment to step out of your everyday life to relax and reconnect with family and friends, come stay at Rabbit Hill Cottage and let this special home become your home away from home.